Photograph album, cover of black canvas with black pages 40 pages of photographs, some now missing. Photographs show houses in Milton, farm life, sporting activities, cars, nurses, beach scene. Associated with life of Lydia B. Cannon and Black family members of Milton. Catalogued with other materials at storage facility in fall of 2005 prior to movement into the museum. 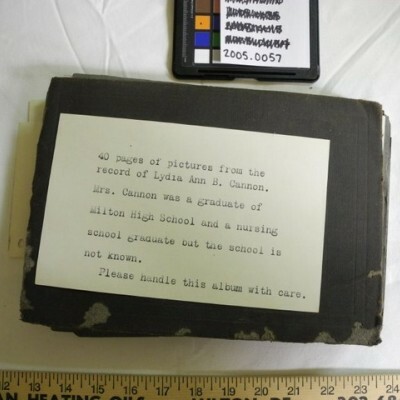 Found with note: "40 pages of pictures from the record of Lydia Ann B. Cannon. Mrs. Cannon was a graduate of Milton High School and a nursing school graduate but the school is not known. Please handle this album with care." Other note identifies: "Joseph Black of Cave Neck Road and Martin Black of Union Street"